My copy of The Sewing Bible is a review copy from Potter Craft. When I first received it, I quickly flipped through the projects, didn’t see anything I wanted to make, and set it aside. This did not do the book justice at all. If they’d meant for it to be a pattern book, they’d have titled it God’s Gift to Sewing Patterns, Oh Yeah. This is not a pattern book. It’s an incredible reference book for beginning sewers like me (and maybe also for not-so-beginning sewers). I was having an issue with the pieces I cut for the big cushions. I didn’t really know how to describe it, but they were wonky. Even though I thought I’d squared everything up nicely before cutting, they were decidedly un-square and fraying terribly. And then I read p. 20-21 in The Sewing Bible and learned about straightening the grain. I’d always known that you should straighten the grain before cutting or Bad Things Will Happen, but I’d never known exactly how to go about doing it. Well, the instructions are right there in the book, in plain English, with pictures that show exactly what an off-grain piece of fabric looks like. 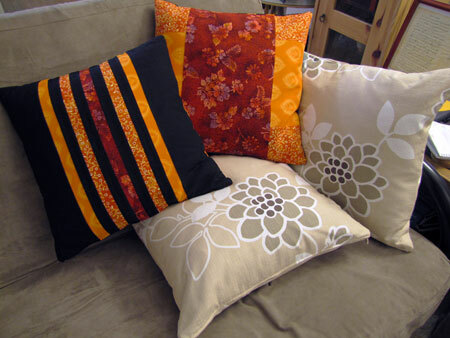 I straightened the grain and re-cut my big cushion pieces. The section on zippers is equally miraculous. The directions for shortening a zipper are perfect, and it shows you several different ways of installing a zipper, again with many useful pictures of the intermediate steps. I used the instructions for an inset zipper and finished putting in all four zippers in one evening. 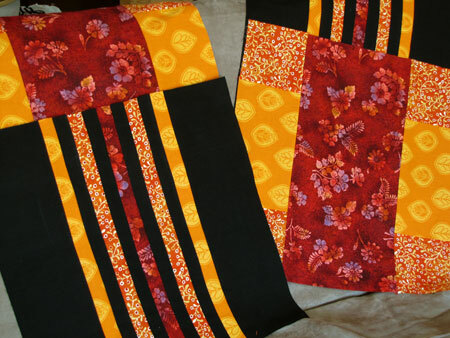 Then I finished all the seams according to the guidelines on p. 37. Now that I’ve gotten a closer look at this book, I’m amazed that there are only three reviews for it on Amazon (all rave reviews, to be sure). If you want to learn to sew but aren’t sure how to go about it, buy this book! It covers everything from hemming to box pleating and pin-tucks to quilting. Speaking of quilting, I’m about 75% done with the baby quilt top! And when I’m finally ready to quilt it, I’ll be reaching for this book for sure.